So your players love Epic, and they want to crush each other in tournament play. Great! And you’ve ordered a tournament kit to make that happen! But what now? Well, if you’re experienced in running events, you might already figure out how you want to use it. You know your players best, but if you prefer a more standardized approach, we can walk you through our intended tournament kit use which should match player expectations. Open up those promo packs. Each one should contain 8 copies of one card, and 2 copies of another. You should have 32 copies of one card, and 8 copies of the other. These are promos. They aren’t typically legal for tournament play until they appear in a regular Epic set. Kickstarter backers got a full set of these. The 32 promos are participation prizes. The tournament kit was intended to handle 32 people, though if you have more, you can decide if you want the top 32 players to get one, or the first 32 to sign up. However you want to do it. The 8 cards are intended for the top 8 players. You can do it differently if you like. We don’t restrict how you use these promos, except: DON’T SELL THE PROMOS! That’s all we ask. 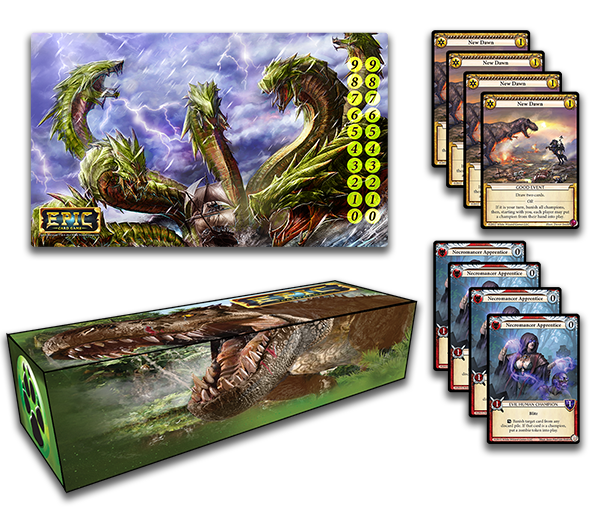 The Deck box and Playmat are intended for the finalists, with the winner getting the playmat. However, sometimes the winner would prefer the deckbox. We usually give the winner the choice of prizes, with second place taking what’s left. As for the format for your event, listen to your players. Epic plays fine as constructed or limited. If you’re not sure, it’s probably best to do limited. For constructed, players should build a 60-card deck with no more than 3 of any one card, and for every (0) cost card, the deck needs to have two (1) cost cards of the same alignment. Easy enough. Players make their decks ahead of time, so the tournament isn’t slowed down by deck construction. Random 30 is just that. Each player is dealt a random deck of 30 cards. Players can examine their decks before they play. If you’re not sure which limited format to run, use this one. It’s faster, it has fewer headaches, and it’s the simplest format to explain to players. Dark Draft takes longer but is more fun and skill intensive. Each player takes 5 random cards from a set. They each choose one of those cards, drafts it (puts it in a face-down pile), and passes the other four to their opponent. From the four, each player chooses two cards. The final two cards are put aside. Each player should have three cards. Repeat this process nine more times, and each player will have a 30-card deck. Check out the Epic rulebook for more limited formats. We recommend running a Swiss-style tournament, either 4 or 5 rounds (depending on attendance) with a cut to top 8, 4, or 2. You can find the official Epic Card Game tournament software at epiccardgame.com/matchslip (coming soon).